Eight years after being mothballed, INEOS has confirmed that it has successfully completed operational trials on the second manufacturing unit (Train 2) of its gas cracker at Grangemouth. In 2008 the KG ethylene cracker was unable to operate at full capacity and INEOS was left with no option but to close the second manufacturing unit. “We’re now in great shape to receive shale gas from the US and to finally run the Grangemouth plant at full rate,” says operations director Gordon Milne. Train 2 has undergone rigorous recommissioning trials to prepare for the arrival of US shale gas ethane. The first deliveries of US shale gas are expected to arrive by ship at Grangemouth in the autumn. 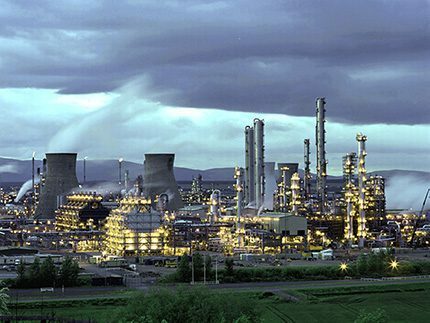 “All the parts of the jigsaw are finally coming together and Grangemouth will soon be back in the premier league of European petrochemical plants. INEOS is one of very few companies with the imagination and skill to vision and deliver a project of this size and complexity,” added Gordon. The new import terminal at Grangemouth will also benefit the Fife ethylene plant facility in Mossmorran after it was announced that the plant’s owners had agreed a long-term sale and purchase agreement to secure ethane from mid 2017. Access to this new source of feedstock will help complement supplies from North Sea natural gas fields. The agreement will also ensure the competitiveness of an additional major manufacturing facility in Scotland and help secure skilled jobs in the long run. Bringing the site back into profitability is the best way to secure our future here in Scotland,” said John McNally, CEO Ineos Grangemouth. Representing the culmination of a $2 billion investment by Ineos, on 23rd March the world’s largest multi gas carrier, the Ineos Intrepid docked at Rafnes in Norway carrying 27,500m3 of ethane from US shale gas – the first ever to be shipped to Europe.